Your time in Costa Rica is precious; get the most out of your stay by treating yourself to one of our many exciting tours. The only multi-tasking you'll ever need to do while vacationing is listening to music while drinking beer on the Booze Cruise. We offer a full day or half day booze cruise. It’s full of the 3 B's: boating, boozing, and beaches. Enjoy the awesome DJ and the premium open bar on the booze cruise. Guzzle the island drinks, and get buzzed on the tropical paradise of Costa Rica. Forget Carnival this is the best cruise around. 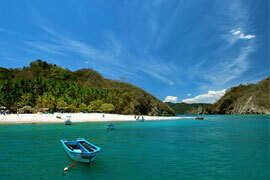 After the booze cruise head off to some of the awesome world famous Costa Rica Tours like beautiful Tortuga Island. Tortuga Island is perfect to do some snorkeling and have a calm afternoon lunch. Or bring out your competitive side with some watersports, and then refill your tank with a gourmet lunch and beachside drinks. 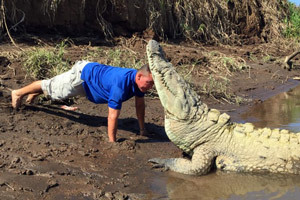 Check out the Crocodile Tours to see the crocodiles like you never have before. 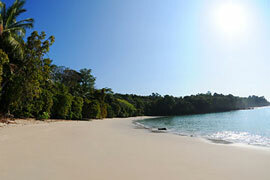 For the nature lovers you can’t miss Manuel Antonio Park where you can see monkeys and beautiful birds. Surfing lessons are a must for the athletes. Our instructors were born on a surfboard so you'll leave feeling like a pro. The most popular tour is the ATV Jungle tour through the mountains on a 4-wheeler. These are by far the most fun too. We highly recommend this before you leave if you don’t mind getting a little mud on the tires. Feeling adventurous? We dare you to try the Zip Line Canopy tour, fly safely through the jungle. The canopy tours are an experience like no other. 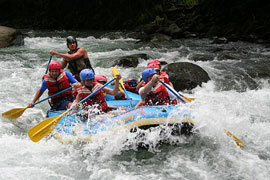 White Water raft through the back country in Costa Rica's most famous rafting rivers. The rapids are classified either as a class 3 or 4 depending on the time of the year. Settle in your mansion after a long day and get a massage from a professional masseuse. If you’re looking to reduce stress this is the best way to end a day in the Costa Rican sun. Get fast and furious on an ATV flying through the Costa Rican rainforest. 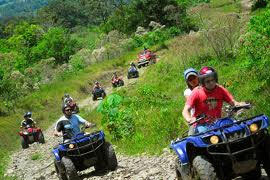 Feed the adrenaline seeker inside of you as you ride through exhilarating spectacular trails in the Costa Rican jungle. Get your buddies together and form a forever bond by travelling through the white water of Costa Rica’s waters. Pick your choice of one of three rafting rivers, Naranjo, Savegre and the Pacuare. This is a must before you leave Costa Rica. The best white water rafting in Central America. You cant miss this. Become an experienced rafter after you raft through Bachelor Party Bay! 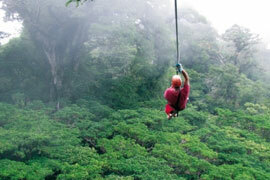 Fly through the Costa Rican mountainside secure in our zip line. Join the monkeys and birds as you travel through the airspace of the rain forest. All aboard. 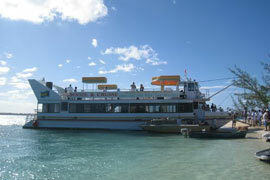 Take out a private cruise boat to have some fun in the sun. Sail across the ocean with your friends, a DJ, open bar and lunch Costa Rican style. Relax on the deck or catch some sun, (No farmers tans here) It doesn't get any better than this. Views out of a post card. Exotic and breathtaking once in a lifetime scenery. Check out one of the most beautiful National Parks in the world. Home to many different species of animals and some birds unique to Costa Rica only. Feel like Captain Jack Sparrow of Pirates of the Caribbean in Tortuga Island. Tortuga island is surrounded by emerald waters, clean, untouched white beaches. It is truly a living fantasy. Feeling a little crazy? Take a trip to Central Costa Rica to the Tarcoles River where you will observe American Crocodiles, terrestrial birds, and other reptiles and amphibians. Don't worry my friends, the boat is extremely safe and the guides are extremely well trained. Feel like your in a zoo but this time no cages! Literally out of dream, the mythical Cloud Forest is sitting high in the rain forest accessible by suspended bridges and the famous sky walk. Words do not describe what they call the last remaining terrestrial frontier. 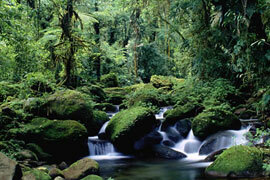 You cannot leave Costa Rica without seeing Monte Verde, it truly is a glimpse into another world.